Colombo: Tickling The Senses | What an Amazing World! Noisy streets and old buses spewing thick fumes welcome me from the airport to Colombo, Sri Lanka’s largest city. Like in other big cities in developing countries, modest houses and buildings line the wayside, tarnished by the sun’s heat and pollution. Drivers of vehicles at all sizes navigate the busy streets with high agility, driving maniacally as they go. However, to my surprise, Sri Lankan drivers highly appreciate pedestrians. No matter how crazy they drive, every time a pedestrian crosses the street at a designated crossing, they would stop the car and let the pedestrian cross safely. It’s definitely something that I haven’t seen much of in my past travels to other developing countries. Fifteen minutes before the plane landed at the airport, two flight attendants sprayed disinfectant throughout the cabin, and from that moment on I knew that Sri Lanka was going to be a completely different experience. 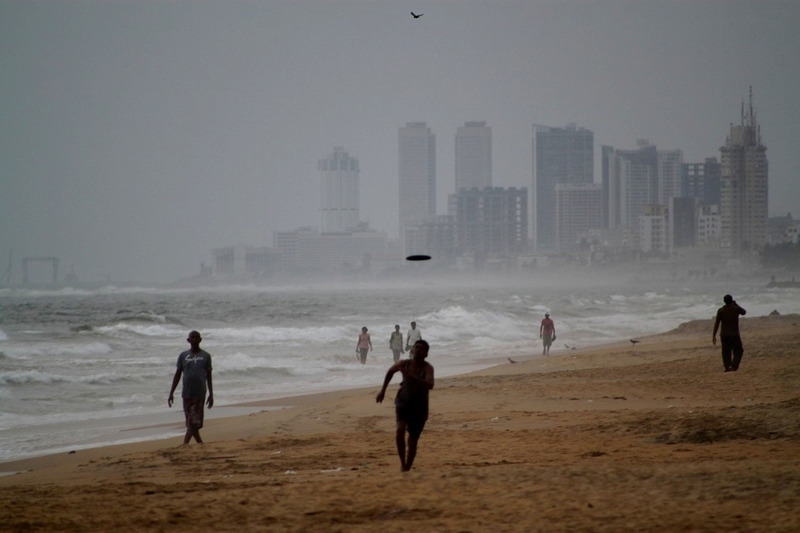 Staying at Mount Lavinia (or Galkise in Sinhalese) – a beach town just south of Colombo – I had to take a bus to get to the city center, a one-hour ride in a hot and humid metal box crammed with other passengers. 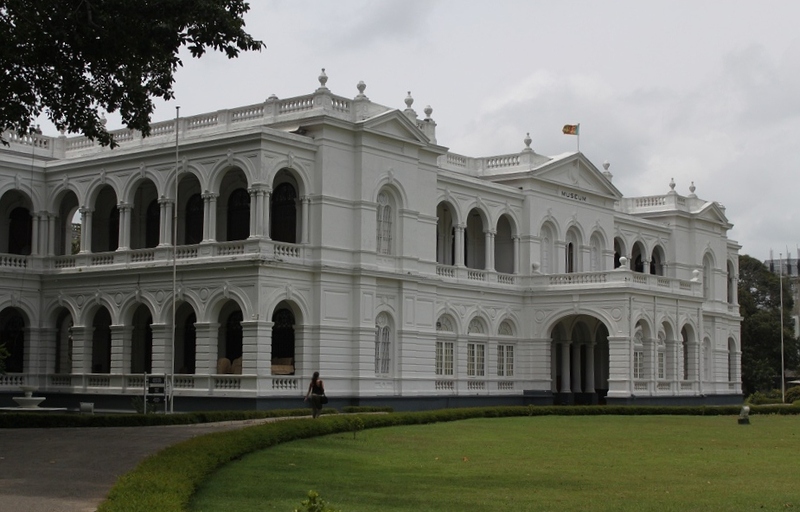 Colombo itself boasts some remarkably beautiful British colonial buildings, including the neo-baroque Presidential Secretariat building in the Fort district. Unfortunately photography is not allowed and military personnel constantly watch over all passersby – a reminder of the long civil war which ended only three years ago with the defeat of the rebel forces. Some other elegant buildings from colonial times sit nearby, making this part of the city the most European-looking of any district. With only one full day to explore Colombo before continuing my journey to the interior of this teardrop-shaped island, I pay a visit to the beautiful National Museum near Cinnamon Gardens. 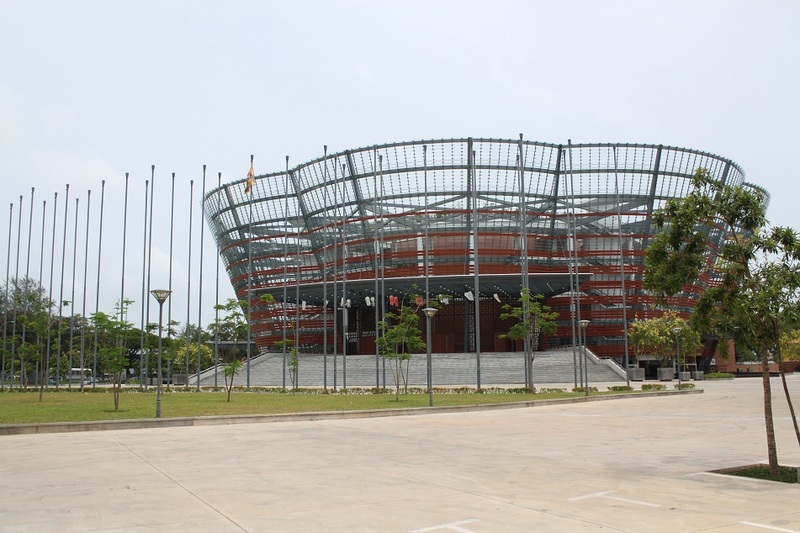 Hosting some of the country’s most precious historical artifacts, this museum is the place to go to get a better understanding of Sri Lanka’s history before venturing deeper into the ancient sites. As a city where magnificent old buildings adorn many quarters and lively street vendors flock to other corners, Colombo is surprisingly a thriving place for many kinds of animals – contrary to what happens in most cities in developing countries. Chirping birds and squeaking squirrels are some of the most common sounds amid the car horns. Colombo – albeit not my favorite place in Sri Lanka – offers a lot to experience: from the bright red British buildings in the old district, to the strong aromas of Sri Lankan curry; the amusing squeaks of playful squirrels, and the calming sound of waves washing up on the beach. This is a city that is not immediately captivating at first glance. But you need to open your senses and let everything else around you tickle them. I’m glad you saw Colombo has potential, because it is a vital, and interesting city with much hidden beauty and lots of whimsy. And, every week, it seems, improvements are being made to the roads and parks, the canals dredged and boating introduced, as years of neglect are now being put to rights. Out near the ‘new’, Geoffrey Bawa-designed Parliament building where I live, there’s lots of ‘wildlife’ drawn to the remaining enclaves of paddy and the village-like profusion of fruiting trees in every garden. I know I should have spent more time in Colombo because I barely scratched the surface, and I agree with you that Colombo has potential to be a very interesting city. Maybe one day when I come back I’ll be surprised with how much it has changed. Bama, there really isn’t much need to spend a lot of time here, but it is the capital, and getting to know it a little does give one a good insight into the country – because lets face it, beaches, ancient ruins and national parks aren’t the real Sri Lanka, as much as we might admire them. The pace of change has been phenomenal since the war – well, really the last twelve months since they’ve put together a squad drawn from the army to work on beautification and refurbishment. It’s amazing. And it’s wonderful to see how the people are flooding back into the city and using the newly liberated parks and waterways. Meredith, you’re right. When I was walking around the Fort district I could sense the beautification and refurbishment project that you told me. Actually I had this weird feeling seeing the soldiers at some points around the city and realizing that the civil war had just ended not too long ago. Looking at how people from different ethnics and religions mix together is a very relieving thing. However, I can sense that the country is now on the crossroads. Hopefully it is leading to the right direction toward peace and justice. Finely poised, I think, Bams. Very worrying time and I’m not as confident as I’d like to be that the chauvinism of the victors isn’t going too far … Won’t say any more. Being half Sri Lankan, it was very interesting to read your views of Colombo, and I think you will enjoy it much much more once you get out of the city and seeing what else the country has to offer. Thank you for sharing this, I hope you have a great time! In fact I really enjoyed my time exploring the Cultural Triangle. Sigiriya is my favorite! But before that, I’ll write other stories on the ancient towns first. I loved Sri Lanka – have some magical memories of the time I spent in Nuwara Eliya, Bentota and Colombo – the 3 places gave me a feel of a hill station, a beach and of course the buzz of the capital and I loved each of those experiences! Oh I almost went there but my driver told me that during summer Nuwara Eliya is not at its best, so I decided to skip it altogether. Maybe one day when I come back to Sri Lanka I will. You’ve made some perceptive observations here, which give me a good idea of what to expect if I do get to visit Colombo. I like the way you’ve compared with other big cities in developing countries, as it’s something I can relate too. Thanks Denise! I hope you will have a great time in Colombo! Ayobowan…We’ve just spent three weeks in SL and had a brilliant time, but didn’t manage to get to Colombo, we just got to the point where we needed to take it easy from travelling and as we were returning to London, a city experience just wasn’t on our priorirty list, so its good to see some of your photos and get an idea of the city…have fun travelling ..! Honestly, I prefer the ancient sites to Colombo. But maybe if I spent a few more days, I would have had different experience. Thanks for dropping by and stu-ti! Do you have any plans for India on this trip? Unfortunately no. But I’ve always put India high on my list. Hopefully sooner than later I will get the chance to go there! Oh really?? But it’s right at your doorstep! 🙂 Anyway, it’s very close so chances are you’ll visit it sooner than later. Madhu, I can believe really! I think everyone neglects the countries closest to them, and are drawn to the farther destinations. I know I’m guilty! I’m a few miles off the coast of South America, and I haven’t stepped foot on the continent yet! Bama, I’ve always said that I’d love to pass through Sri Lanka too… mostly because of our mutual history of Cricket. Oh the ties that bind lol! Thanks for dropping by! I also noticed the same thing that most travelers go to India and miss the rest of South Asia. But Sri Lanka is indeed a jewel in the Indian Ocean – like how it used to be called in the olden days. I hope you’ll have a very nice experience in Sri Lanka next January! *its- tiredness is no excuse for poor grammar! Mas Zavitto bilang bahwa Kolombo jauh lebih bersih dan rapi di banding kota-kota di India. Is that right? Tiket ke Kolombo berapaan ya, mas? Mas Zavitto itu siapa ya? Saya belum pernah ke India sih, tapi dari cerita orang-orang sih memang benar. Ketika mereka ke Sri Lanka setelah dari India mereka bilang Sri Lanka kayak surga, jauh lebih teratur dan bersih. Dari pengamatan saya sih saya cukup impressed sama komitmen mereka terhadap lingkungan. Waduh, saya ke sana dulu tahun 2012, jadi tiket sekarang pastinya lebih mahal karena harga minyak dunia juga sudah naik. Coba cek di budget airlines aja. Ohh haha. Enggak (belum) kenal saya sama dia. Sama-sama. Pingback: Reviving Colombo’s Cosmopolitan Flair | What an Amazing World!